AND NOW HE IS ON HIS WAY! It’s 40 years since Robert Cleave from Bramcote first dreamed of doing a long-distance cycle ride. But he never thought he’d be cycling around the world – which is what he’s commencing on Saturday 7 April. 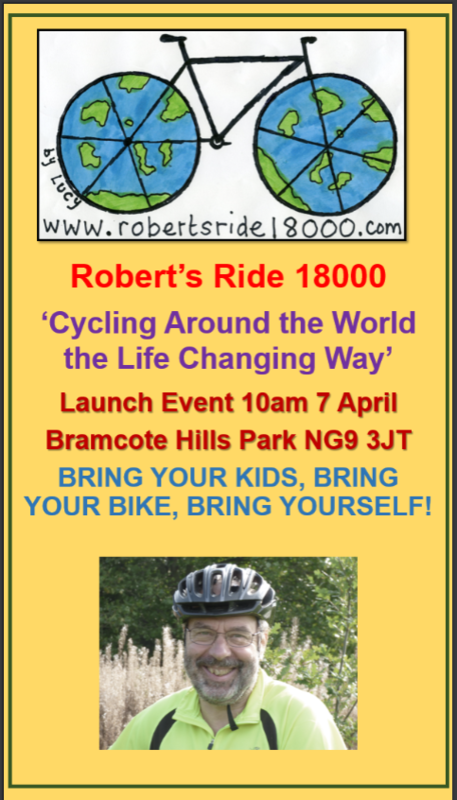 Departing from an official launch event at Bramcote Hills Park at 10am Robert will cycle through 5 continents and 25 countries tallying up 18,000 miles. He’s not looking to break any records but is committed to raising money for two charities close to his heart – Traidcraft Exchange and Cancer Research UK. He’s calling the epic journey Robert’s Ride 18000 – Cycling Around the World the Life Changing Way. “It’s all about transforming lives. With his comprehensive training programme having paid off Robert invites everyone to join him for the first mile of his 18,000 at 10am on Saturday 7 April in Bramcote. He will be blogging throughout the trip. To follow his blog, make a contribution to his charities or contact Robert or his team of UK- based Co-ordinators, see his website and film at www.robertsride18000.com.